In a previous post, I introduced you to Caitlin and Matt, two of the main characters in the contemporary strand of my latest release, A Mountain of Memories, which is available as an ebook here and as a paperback here. Woven through the contemporary story there is a historic thread, and in the video below, I introduce you to Mhairi, the main character of that strand. A childhood trip from Edinburgh to explore Caitlin’s family’s history results in tragedy on a mountainside above the village of Kinlochleven, a tragedy so traumatic it was wiped from her memory. As an adult she is still affected by the events that took place there. Over a century earlier, Caitlin’s great-great grandmother, Mhairi, watches the village of Kinlochleven being born, suffering through its birth pangs. Caitlin and Mhairi’s lives are linked by their common heritage, and as their stories become intertwined, Caitlin is drawn back to the question that has haunted her for eleven years. What really happened on that mountainside? 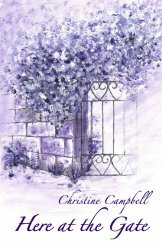 A childhood trip from Edinburgh to explore Caitlin’s family’s history results in tragedy on a mountainside above the village of Kinlochleven. As an adult she is still affected by the events that took place there, though most of her memories of that day were lost as a result of its trauma. Over a century earlier, Caitlin’s great-great grandmother, Mhairi, watched the village of Kinlochleven being born, suffering through its birth pangs. “This is an absolute MUST read! I was utterly captivated from the very beginning. A Mountain of Memories is completely immersive, strikingly intelligent and enticingly interesting with a twist you will not see coming. This book explores something all of us can relate to and is written with a depth of feeling, warmth and understanding using words and language with such care and attention, characters so full of depth that they are left in your heart well after turning the last page! Okay! So it seems I need to go back to the current draft of my WIP brandishing a large red pen! Some great suggestions in this article, along with the comments from my beta readers, have made me re-examine my plot. I now know why there were parts that felt sluggish to my readers and to me, and what I think I’m going to do about them. I’m so pleased I stumbled upon the article. It’s so hard to ‘kill your darlings’, as William Faulkner and Stephen King would have us do. I knew there were scenes in my WIP that didn’t fulfil two important criteria: to move the plot along or to develop the characters. But I like those scenes. There is some great writing in them: some clever, witty dialogue, some great observations on life, some handsome metaphors. But the story could live and thrive without them. One of my trusted beta readers (she’ll know who she is :-)) tactfully pointed them out when she said I didn’t have her whole attention at some points in the story – backing up my intuitive feeling. Then I read this article. “If a character with a subplot isn’t absolutely vital to the denouement, use that red pen,” Kathy says. I’d already deleted part of one character’s involvement. Now I think more the rest of her part needs to go. There’s another character, Elouise, who I know I shall keep, but I don’t need to tell her story. This is not her story. It is Yvonne and Hugh’s story. She can play a part in it, but it is not about her, much and all as Elouise would like it to be. Elouise is a great character and her story is interesting, so I shall delete those scenes in this WIP and use them in the novel I already planned to write about her at another time. I know she’ll be pleased to have a novel all about her. She’s that kind of girl. Win/win. What fun editing can be when you listen to the wisdom of others who know the craft, and you find the courage to take their advice. Okay, so this is all very well to talk about in theory, now I have to see if I can go through with it. Where’s that red pen? Gulp! What about you? Is this article helpful to you? – well, I know, you’ll have to read it first, but after you do, why not let me know in the comments? I’d love to find I’m not alone in this. We’re going to spend a little bit of time on plot this month—talking about what NOT to do. Sometimes it’s hard to see plot problems while you’re writing and you don’t notice them until the end. This will send some writers into a downward spiral of negative self-talk. Others will white-knuckle their way through half-hearted revisions. Here are a few common plot pitfalls and what you can do to rectify them. A couple of months ago, on June 29, 2016, I was interviewed by Meryl Stenhouse, here on her blog. She had invited me to talk about my latest release, Rusty Gold, the third book in The Reluctant Detective Series. The words of a dying woman force Mirabelle to take on another case for the unofficial Missing Persons Bureau she runs from her Edinburgh flat. Along with her assistant, Kay, she heads for the island of Skye where Esme Donald was last known to be. But is someone else looking for Esme too? And could Mirabelle’s own daughter, Summer, be in danger? Meryl asked me some very interesting questions, questions that helped me express the origins of this series, letting readers in behind the scenes of my novels. I hope you enjoy the interview. If you want to see it in its original form, do please go to Meryl’s blog. In fact you might enjoy to do that anyway after reading this post. Meryl has written lots to interest you there. Meryl Stenhouse: Your novel’s heroine Mirabelle is a single mother, which is an unusual but excellent choice. What led you to choose a single mother as your heroine? What challenges and opportunities did this represent in writing the story? Christine Campbell: I chose to tell Mirabelle’s story as a single mother because there are so many single parent families around these days and I think it must be tremendously difficult to balance all the pressures of work or career and bringing up a child or children. I got to thinking what if? What if there was a crisis in a single parent family, like a child disappearing from home? Who would the single parent turn to? What impact would it have on his or her work or career? How would it change his/her priorities? What regrets would he/she have? Things like that. The main challenge it represented was that although I am mum, I have never had to function as a single parent, so I had to try to get inside my character’s head. I had to imagine how it would be different, but also how it would be the same. For instance, the things that I think would be the same are the panic and pain, the anxiety and strain of such a frightening situation. I did’t find it too hard to imagine how I, as a mum, would react: how I would feel, what I would do. A huge difference is sharing the anxiety, panic and pain with the other parent. Whenever there is any kind of difficult or worrying situation in our family, my husband and I can talk about it. We can comfort one another, work out together what we need to do. For a single parent – in my story, a single mum – I would imagine it is very different. Although she may have very supportive family and friends, at the end of the day, she goes to bed on her own and the night must seem to last forever. So I had to work out who Mirabelle’s support team would be, and how and where she would find comfort. One of the opportunities writing this story gave me was to examine how I would feel if I had to do things on my own. I rely on my husband so much that thinking about being on my own in such a dreadful situation was very upsetting for me. Making myself imagine it, get into Mirabelle’s head and heart, walk a mile in her shoes, so to speak, was a great exercise in empathy for me. It helped me appreciate what a great job so many single parents make of bringing up their children. MS: You have included the homeless of Edinburgh as characters in the book, a group that is traditionally invisible. What prompted this decision? CC: In part, it was prompted by the realisation that people can be homeless for a variety of reasons, not all of them their own fault. Even if it is their choice, it is a hard life, but for many it isn’t a choice. The statistics for young people who have left home because of domestic abuse are frightening. For them, even living rough in parks, cemeteries and squats are better than what they had. One young woman I talked to who left home to live on the streets when she was only fourteen told me that she found the homeless community looked after her better than her parents had. She said, yes, she had to choose carefully who she associated with, learning to avoid the unscrupulous, the malicious and those who were too far gone with drugs, but a great part of the homeless community is made up of decent, honest people who have, for one reason or another, found themselves homeless. Some of them are somewhat eccentric, some of them are difficult to communicate with, some may even be somewhat dangerous, but they are still people. I wanted to give a small section of them a voice. MS: Rusty Gold is set on the Isle of Skye. How have you communicated the individuality of that setting to the reader? Have you traveled there yourself? What challenges did this location present to the story? The first two books in this series, The Reluctant Detective Series, are set mostly in Edinburgh or further north but still in the east of Scotland. My husband and I are originally from the west of Scotland and we have holidayed in Skye several times over the years, plus his paternal family originated there, so, when we were planning to visit Skye again for a couple of weeks and it was time to start plotting Rusty Gold, I decided why not take Mirabelle there with us. While there, I researched where I wanted certain scenes to take place, going to each one several times, sitting quietly on beaches getting the feel of them as well as studying them visually, travelling the single track roads across moorlands, through glens and beside lochs. I knew Mirabelle would fall in love with Skye as I had many years ago, so my challenge was to help my readers fall in love with it too. It’s never ideal to have long, descriptive passages in a modern novel, so I tried to give the flavour of the surroundings through the characters’ eyes and actions. I listened carefully to how natives of Skye spoke: they tend not to abbreviate but speak carefully and correctly, with a delightful lilt in their speech. I tried to portray that in the people Mirabelle meets. When I travelled about the island, I was often held up waiting for sheep to move aside, or highland cattle to meander along in front of me, so I allowed that to happen to Mirabelle and her friend as they travelled. From time to time, I felt compelled to stop the car at the side of the road to get out and marvel at some fabulous views, so I had them do that too, in the hopes that my readers would be able to imagine the Island of Skye. It is a truly beautiful setting. Rusty Gold is available to buy in paperback and on Amazon Kindle. Amazon – Barnes and Noble – Waterstones – FeedaRead – The paperback can also be ordered from most bookshops. Christine Campbell is a writer. She has always been a writer. For as long as she can remember, she has scribbled poems and prose, snippets and stories on scraps of paper, in the back of cheque books, napkins, on the back of her hand — anything more durable than her faulty memory. She loves being a writer, a novelist, in particular, and she write contemporary fiction: strongly character-based, relationship novels — with a smidgen of romance and a generous dusting of mystery and detection. She has learned a lot about her craft since that wonderful night when she held her first completed, printed manuscript novel in her arms. Her first book-baby. Christine has now completed and published seven novels, the seventh newly ready to leave home and see the big wide world and, even more importantly, to be seen by it. It’s so exciting when your book-babies grow up and leave home. As mother of five grown-up, married children and ten grandchildren, Christine knows a lot about babies growing up and leaving home! I hope you enjoyed Meryl’s interview. Didn’t she ask some great questions? It’s quite an art form in itself, interviewing, and I think Meryl has mastered it. Thank you, Meryl. What do you think? Are there interviews you’ve read that really help you get to know your favourite author better? Or some that made your toes curl? Do share your stories in the comments. I love hearing from you. Traces of Red is the sum of several interwoven stories. While searching for her daughter, Mirabelle finds herself running an unofficial Missing Person’s Bureau from her flat in Edinburgh, where Kay comes to ask for help to find her missing husband. Meanwhile, an abandoned baby is found in an Edinburgh pub and DI Sam Burns is happy to use Mirabelle’s expertise to trace the mother and the young woman who went missing with her. Somehow their stories interlink and, when they find a body in the burn, they can’t help but wonder how many of them they’ll find alive. Once again, much of Traces of Red is set in Edinburgh, but in this book, some of the action takes place further North in Scotland. If you’ve ever driven up the A9 towards Inverness and looked out at the hills, you may have wondered what it would be like to walk there, to climb some of these beautiful hills. But how would you feel about being lost in them? 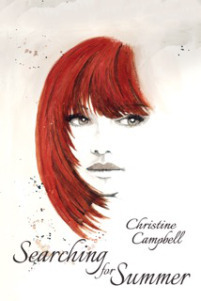 I should have waited until the paperback is ready in all the other outlets too, but so many of you, having read Searching for Summer, have been asking when Book Two of the series, Traces of Red, would be ready. I got overexcited and had to share it with you straight away as soon as the ebook was up and running. and can be ordered from all good bookstores. Why Did You Write That Book? Readers often wonder what inspired a writer to write the particular book they have just enjoyed, and it’s a fair question to ask, since the novel may deal with a subject that is somewhat out of the ordinary or a place they have never been. I know I find it interesting to have some background information about a book I have enjoyed. What about you? Let me know in the comments if you feel the same. For me, It is the same with a series. I like to know a bit of background, if possible. I love if I can find out what experience or snippet of information inspired the author to write on that particular subject. The series I am currently writing, The Reluctant Detective Series, is about Mirabelle, a rather eccentric lady whose daughter went missing. While searching for her daughter, Summer, she builds up a network of contacts and, with the help of them and her friend, DI Sam Burns, she finds other missing persons and is able to reunite them with family. People become aware of her expertise in this area and begin to come to her for help. Reluctantly, she becomes a bit of a private detective and her home becomes an unofficial missing persons agency. The inspiration for this series springs from personal experience. I grew up not knowing my birth father and, over the years, concocted many stories to explain his non-appearance in my life. As an adult, I became a very private detective, since I was my only client, and set about finding out who he was and where he was. It’s a theme I return to in many of my writings. Family Matters, my first published novel, revolves around a woman whose husband abandoned her and her two young children. She’d like to know why, and what happened to him. Eleven years later, after her son dies, she discovers that he’d been trying to trace his father, so she follows the steps he took in an effort to find out how much he’d uncovered. In this book, I draw on some of the procedures I used to trace my father. Making it Home has, as part of its theme, leaving home and whether it’s possible to make one’s way back. 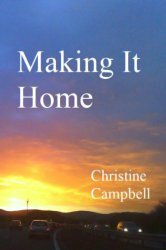 The main protagonists are three women who become friends and help one another overcome their different problems while each works out what ‘home’ means to them and where ‘home’ is. 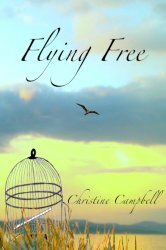 In Flying Free, the main protagonist loses contact with her father, when she and her mother leave the family home when Jayne is still a young child. So, in effect, it is she and her mother who are the missing people in this novel. The story traces Jayne’s efforts to come to terms with the why and how of the situation. Here at the Gate is a story of a secret past, one threatened with exposure. Who is Mhairi? And why is she so afraid of what her daughter might find out when she traces the family tree. Approximately 2,300 Americans are reported missing—every day. This includes both children and adults, but does not include Americans who have vanished in other countries, individuals who disappear and are never reported, or the homeless and their children. That’s somewhere around 900,000+ a year. In Britain alone, an estimated 250,000 people go missing every year. Many of those cases are resolved by police; just 2,500 people remain untraced more than a year after they disappear, some of them stay missing long after a year, ten, twenty, thirty years and more. But that can still mean those who are contacted by police or other authorities do not return home and that families are not told if their loved one is alive or safe. A closed case simply means the police are confident that no crime took place. And how many of these missing people are children or young teenagers? It is estimated that at least 8 million children worldwide go missing each year. 800,000 children in the U.S; 40,000 children in Brazil; 50,500 in Canada; 39,000 in France; 100,000 in Germany; and 45,000 in Mexico; 230,000 in the U.K.
And in most of the developing world—including Africa, Asia, and Latin America—no one is counting missing children. These figures, while chilling, also show me that the fictional stories I have written or will yet write are a drop in the ocean compared to the true stories no-one is writing. I know how it feels for someone to be ‘missing’ from your life. I wonder how many of you know that feeling too? If you feel you’d like to, please feel free to share your story in the comments. In The Reluctant Detective Series, Mirabelle is mostly able to find young women, in their teens or early twenties. Those who have not been missing too long. Though her expertise stretches further, and, with the help of her network of unusual contacts, she’ll have a try at finding anyone. The first of the series, Searching for Summer, is mainly focused on Mirabelle’s search for her daughter, and the building up of her network of helpers. As her reputation for finding missing people grows, she becomes increasingly involved in other cases, the reluctance of the title of the series being because each case takes a bit of the focus off Summer. Traces of Red, the second book in the series, is almost ready to be released, so, if you haven’t yet read Searching for Summer, now would be a good time to do so. It makes a great holiday read, absorbing enough to make your journey pass quickly or to keep you resting by the pool.